Echipa AVmall incearca sa mentina acuratetea informatiilor din acesta prezentare. Cu toate acestea, in anumite cazuri, pot aparea mici inadvertente pentru a caror semnalare va suntem recunoscatori. Ne poti contacta oricand pentru a clarifica eventuale nelamuriri. Nu uita sa mentionezi in corespondenta ta numele exact al produsul. Fotografia produsului Ecran Proiectie Videoproiector Optoma DP-3084MWL are caracter informativ si poate sa difere de produsul real sau sa contina accesorii neincluse in pachetul standard al produsului. Specificatiile tehnice pot contine erori de operare si pot fi schimbate fara instiintare prealabila de catre producator, neconstituind obligativitate contractuala. The Optoma Pull Up is an ideal screen for travelling, whether it's from room to room or around the country. The screens come in different sizes from 72” to 95” and also format 4:3, 16:9 and 16:10 to meet most projection requirements. 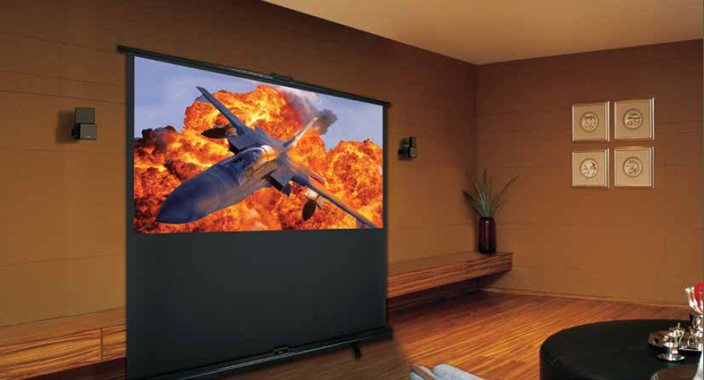 These screens are also great for rental companies were you′re unable to mount a screen to the wall or a ceiling. Optoma MWL screens are available in both business presentation (4:3 ratio) and home cinema (16:9 ratio) formats. These screens are ideal for rental companies when mounting a screen to a wall or ceiling is impractical. In use, two support legs, which are otherwise conveniently hidden from view, slide out from under the casing. These legs come with height adjustable floor stands for use on uneven surfaces. For additional vertical stability, the support bar comes with an additional height adjustable floor stand. The design of the intelligent interlock ensures that the screen is fully secure in use and during transport. When the support bar is lifted, the case automatically unlocks, allowing the screen to be pulled up. When the screen is retracted, the case will automatically be locked. This innovative safety feature is easy to use and standard on all sizes. The patented one-way lock allows the back support to be fully secured and easily adjustable. A multi-purpose handle is not only used for raising and retracting the screen, but for securing it to the support bar too, preventing the screen from falling or shifting positions. During use, two support legs which are otherwise hidden conveniently slide out from under the casing. The support legs come with height adjustable floor stands for use on uneven surfaces. For additional vertical stability, the support bar comes with an additional height adjustable floor stand. Nu sunt recenzii pentru Ecran Proiectie Videoproiector Optoma DP-3084MWL. Fii primul care scrie una!